Like every recruiter, you want to hire the best person for the job. But, you also want to hire quickly. And, balancing the two can be tough. To help you shorten your hiring process without sacrificing quality, we’ve put together a list of companies that used specific strategies to do just that. As a result, they’ve dramatically cut their time to hire—and improved their candidate experience. When hotel chain Hilton Worldwide decided to speed up its hiring process, its average time to hire was 42 days—more than double the industry average. This was making it hard to compete for top talent against faster, more nimble competitors. Hilton’s recruiting team started looking for areas of inefficiency and realized the interview phase was a key culprit. Screening, scheduling, and then conducting interviews themselves took up a lot of the recruiters’ time. So to solve the problem, the company experimented with video interviewing. Using on-demand digital interview platform Hirevue, Hilton found it can interview multiple candidates at once—without a recruiter being present. Candidates can interview at home and at a time that works for them by signing into the platform on their phone or computer and going through the built-in list of questions. Recruiters are then able to watch the videos and quickly determine if a candidate could be right for the role—and if they think the person might be better suited to another position, they can simply send the video along to that department. Not only does the platform allow for convenient video interviews, it also includes artificial intelligence (AI) features that evaluate candidate communication skills and non-verbal gestures. For customer service roles, Hilton’s recruiters can even use simulations to test how a candidate will react to an angry customer. The results of this new approach were staggering: after implementing video interviews, Hilton’s time to hire dropped from 42 days to just five. The strategy also streamlined executive hiring, allowing leaders from various offices around the world to easily join remote panel interviews. It’s no surprise that Google attracts a lot of talented applicants, and narrowing them down to the best of the best can take time. A lot of time, in fact. Former interviewees sharing their experiences on Quora report that the process can take anywhere from two to four months. 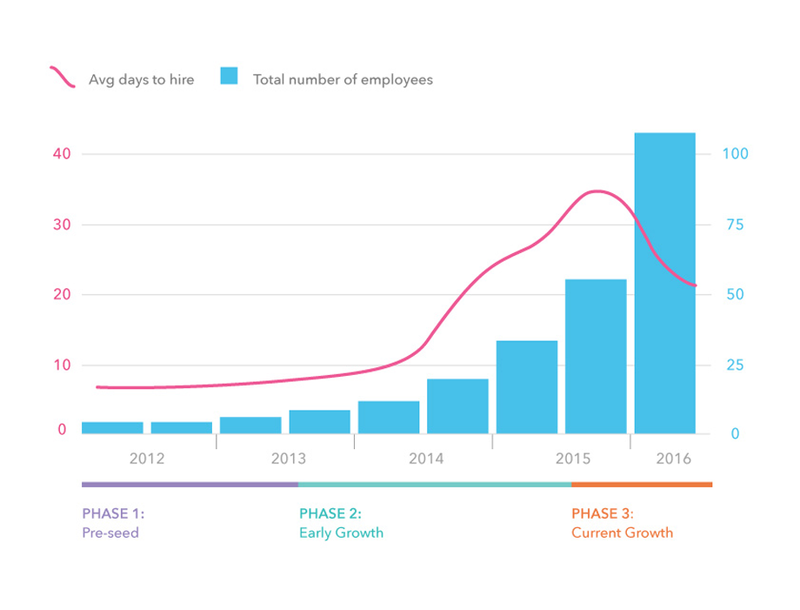 Realizing that this model was not sustainable, the company looked at its interview data from over a five-year period. At every interview, the interviewer would assign the candidate an interview score. The theory was that the accuracy of the mean interview score would increase the more interviewers were involved. To Google’s surprise, the data revealed this was not the case. Four interviews with four interviewers provided an accurate prediction of a new hire’s performance 86% of the time. Adding more interviewers produced rapidly diminishing returns, increasing the accuracy of the predictive score by less than 1% per additional interviewer. This was consistent with the company’s data about panel interviews. The decisions made by panels with four people were almost identical to those made by busier panels in 95% of cases. 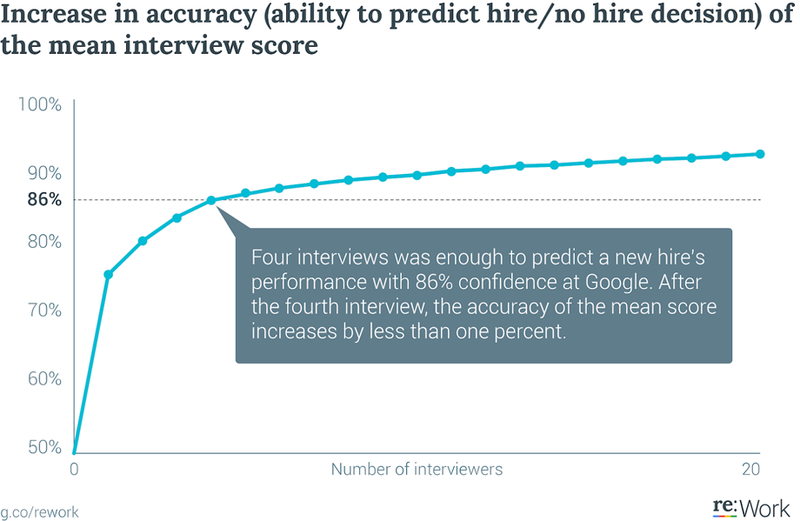 Using this data, Google implemented a “Rule of Four” standard for most of its interviews. 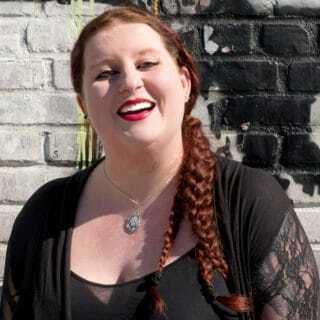 Using a maximum of four interviews, the company cut its time to hire by about two weeks—making the process less stressful for candidates and saving, according to Shannon, “hundreds of thousands of hours” of employee time. When Eric Johnson was hired by Typeform, a software company specializing in online surveys, the process took 63 days and involved five cumbersome steps. A phone screening was followed by two onsite interviews, a two-hour Skype session, a final interview with one of the company’s cofounders, and several rounds of testing to top things off. The five-step process was designed to ensure the company’s rapid growth didn’t lead to a drop in quality. But as the number of employees increased, so did the time to hire—jumping from a week to a month and beyond. In 2015, Typeform began consciously measuring its hiring process to identify what was going wrong. By the end of the year, it had its first benchmark metric: on average, it was taking 35.7 days to get to an offer. But some hires, like Eric himself, took much longer. Rather than scrapping their existing process entirely, Typeform’s newly-appointed team of dedicated recruiters focused on streamlining it. Some major inefficiencies stood out, like the fact that almost all candidates passed the early tests, making them a bit pointless. After dropping the tests and interviews that weren’t helpful for filtering, the company noticed that the quality of candidates actually went up—and frustrations among HR and hiring teams went down. The company also realized that holding three interviews over a period of three weeks or more was just plain inefficient and a real headache for everyone involved. Luckily, they found a simple fix to this problem—holding all three interviews on the same day (or within the same week if that wasn’t possible). The candidate experience improved, and the hiring team could make sure the candidate remained fresh on their minds throughout the interviews. After stripping out these inefficiencies, Typeform’s exhaustive five-step process had become a much more manageable three steps. Within two quarters, the average number of days to offer had dropped to 20.1—43% quicker than the previous benchmark. In the healthcare industry, a lengthy time to hire isn’t just bad for the company and candidates—it can affect patient care. That was the challenge facing the UK’s Newcastle Upon Tyne NHS Hospitals Foundation Trust, which provides specialized care for over two million patients every year. In 2015, the average time to hire was 18-24 months—with the recruitment of nursing staff being especially delayed. After reviewing the hiring process and running drop-in sessions to hear directly from the staff on the ground, the HR recruitment team spotted that employment checks were a big reason behind the delays. Applicants were only being prompted to provide the required documentation after their interview, and often submitted the wrong things. To conduct the checks more efficiently, the team gave applicants handy checklists with what documentation to bring and when. This was a helpful step, but after piloting new recruitment packs, more problems became clear. For example, it took time to hear back from a candidate’s references—and it was often discovered too late that important contact details were missing. Recruiting managers were encouraged to use automated emails and reminders to nudge referees, and to double-check the reference information was correct at the interview stage to avoid delays. By 2016, these simple changes helped Newcastle Hospitals cut its time to hire by more than half (down to eight to 10 weeks). The hefty 127-step process was stripped back to 53 helpful steps. Within the first six months alone, these changes saved Newcastle Hospitals 25,000 working days. Even small adjustments like automating emails or gathering reference information earlier can make a huge difference. Find the bottleneck in your process, experiment with solutions, measure your results, and keep refining. You’ll save time and money, keep candidates engaged, and reduce frustrations all around.